Why this Evaluation? • Severe acute malnutrition (SAM) affects millions of children and contributes to close to a million child deaths a year. 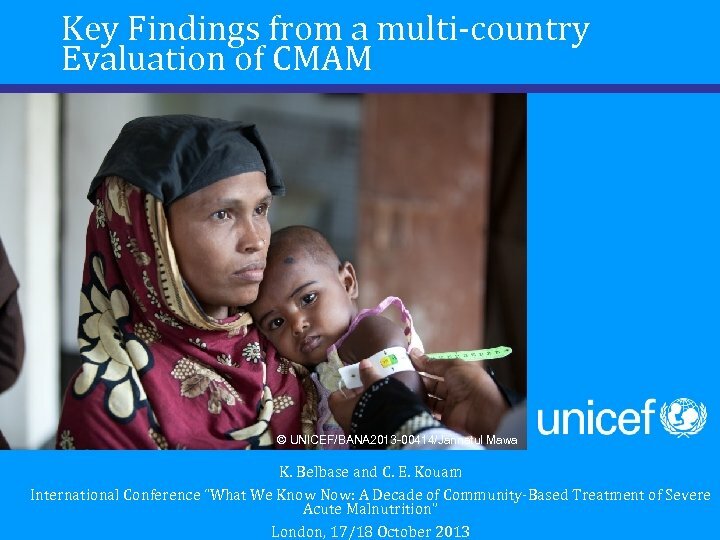 • CMAM is an important and growing area of UNICEF’s work (implemented in 63 countries by end 2012). 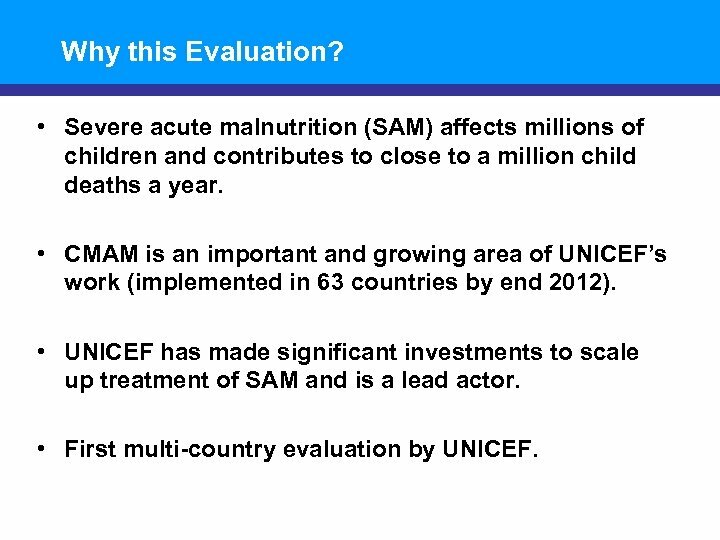 • UNICEF has made significant investments to scale up treatment of SAM and is a lead actor. 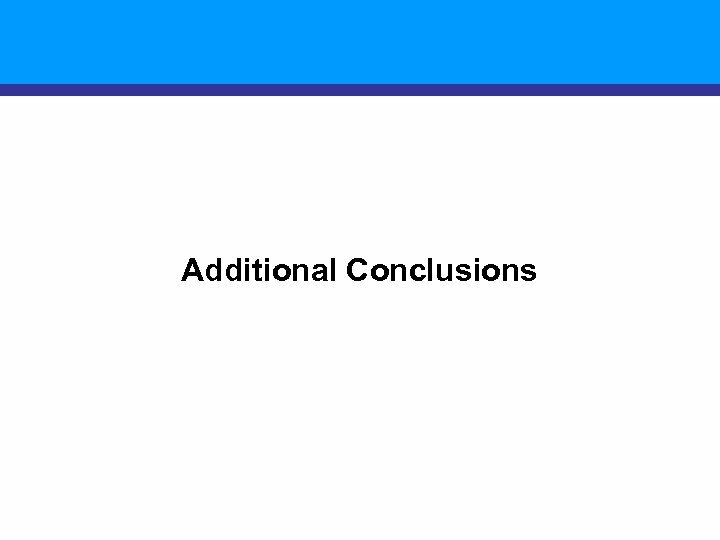 • First multi-country evaluation by UNICEF. 1. 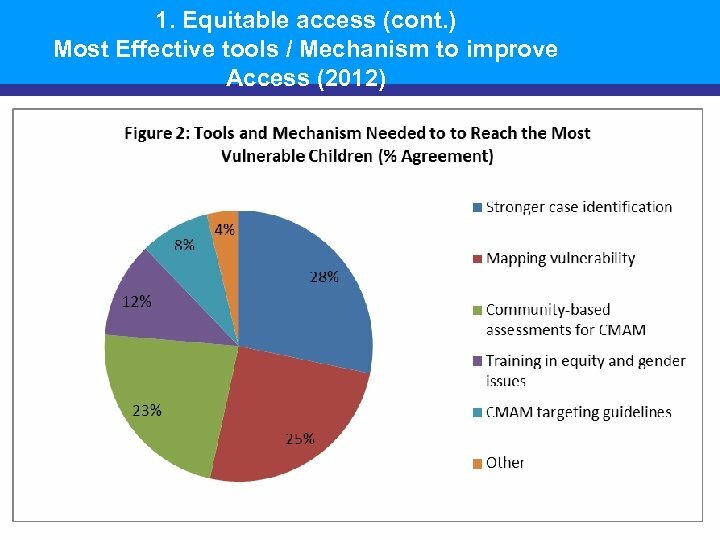 Equitable access Promoting Equity in Access • Top challenges in improving access: identification of children who might be missed and developing strategies to reach them. • Disjointed planning among government, assistance partners and communities for CMAM, which hampers the promotion of equity and coverage. • Weak awareness of challenges in estimating geographic and treatment coverage in order to promote effective strategies to increase access. 1. 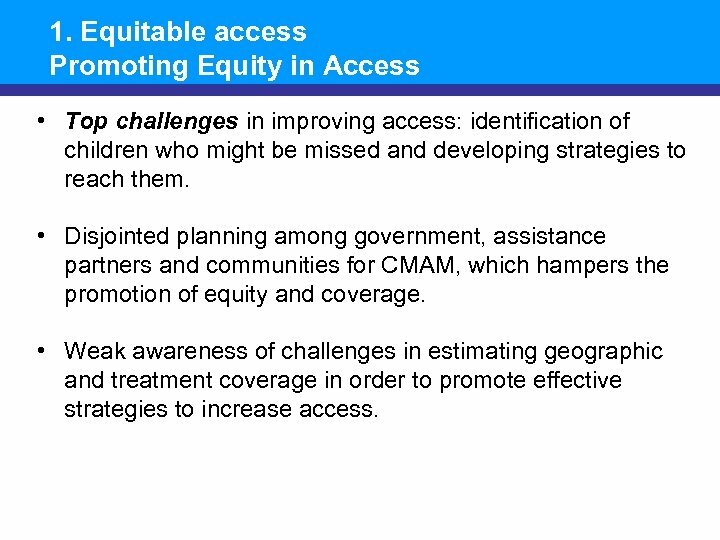 Equitable access (cont…) Major Challenges in Conducting Treatment Coverage Surveys (2012) • Treatment coverage surveys are not planned or funded. • Reliable data is not available on which to make the coverage calculation such as • • Estimates of SAM prevalence Population numbers (lack of registration of new-borns and constant in and out migration) • Technical expertise rarely available. 2. 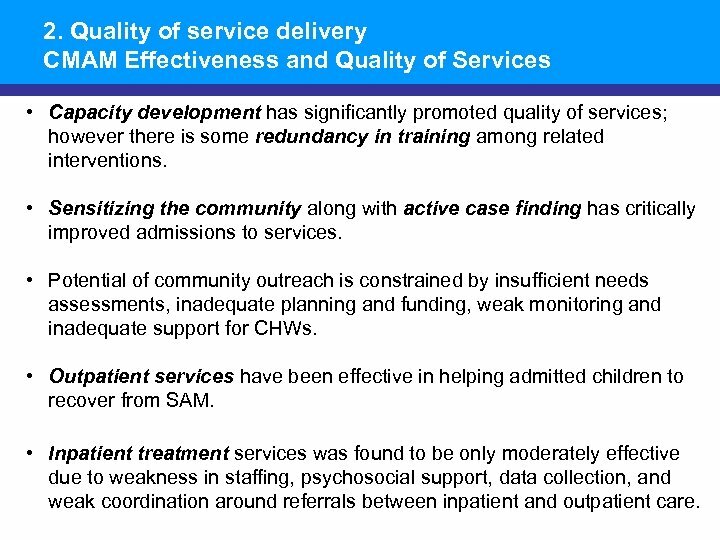 Quality of service delivery CMAM Effectiveness and Quality of Services • Capacity development has significantly promoted quality of services; however there is some redundancy in training among related interventions. • Sensitizing the community along with active case finding has critically improved admissions to services. • Potential of community outreach is constrained by insufficient needs assessments, inadequate planning and funding, weak monitoring and inadequate support for CHWs. • Outpatient services have been effective in helping admitted children to recover from SAM. • Inpatient treatment services was found to be only moderately effective due to weakness in staffing, psychosocial support, data collection, and weak coordination around referrals between inpatient and outpatient care. 3. 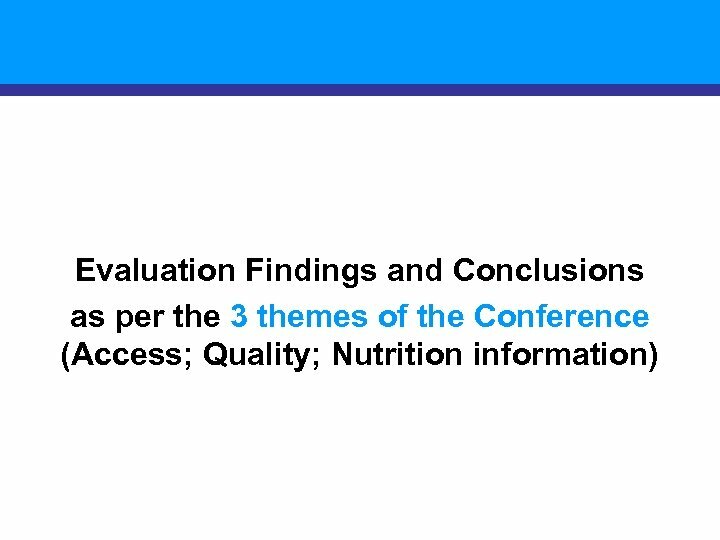 Nutrition information • Lack of harmonization in reporting systems among partners poses challenges for evaluating effectiveness. 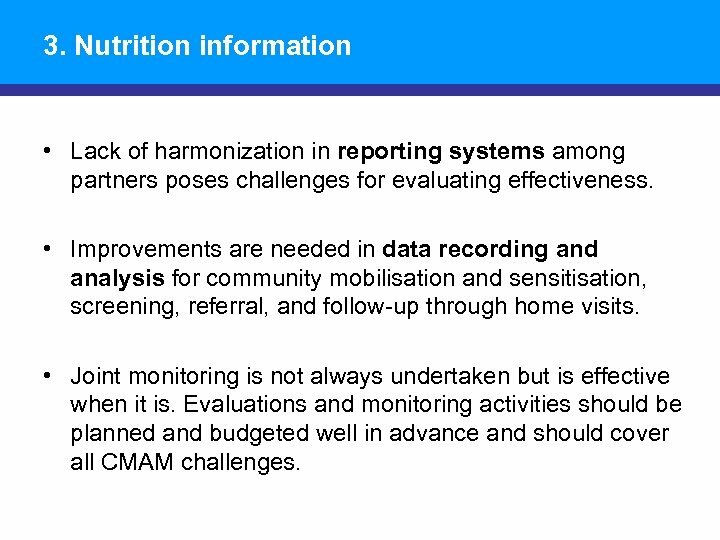 • Improvements are needed in data recording and analysis for community mobilisation and sensitisation, screening, referral, and follow-up through home visits. • Joint monitoring is not always undertaken but is effective when it is. 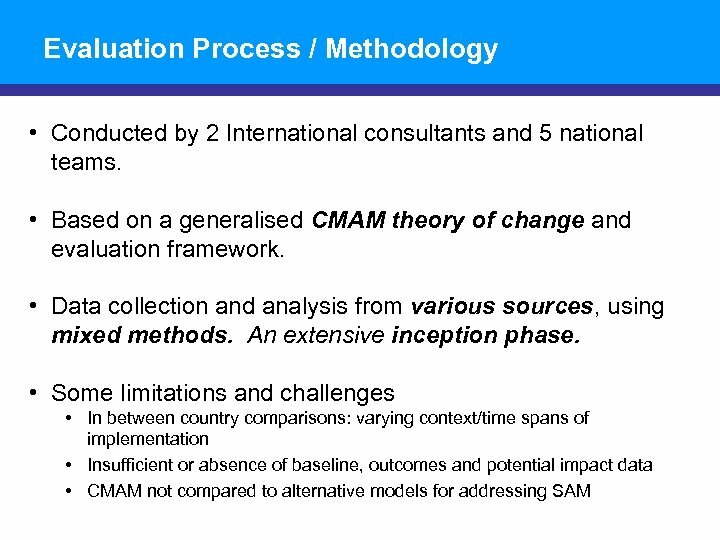 Evaluations and monitoring activities should be planned and budgeted well in advance and should cover all CMAM challenges. 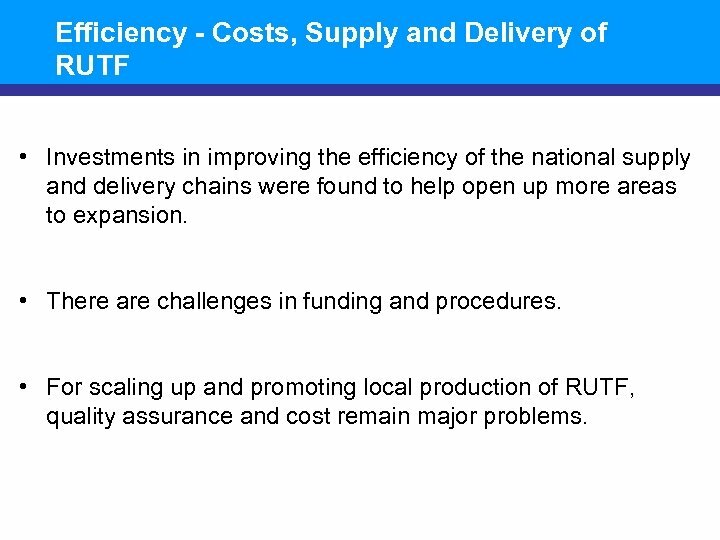 Efficiency - Costs, Supply and Delivery of RUTF • Investments in improving the efficiency of the national supply and delivery chains were found to help open up more areas to expansion. • There are challenges in funding and procedures. • For scaling up and promoting local production of RUTF, quality assurance and cost remain major problems. Sustainability and Scaling Up • Scale-up and integration are facilitated by good coordination among partners; but a cohesive vision for addressing acute malnutrition does not always exist. 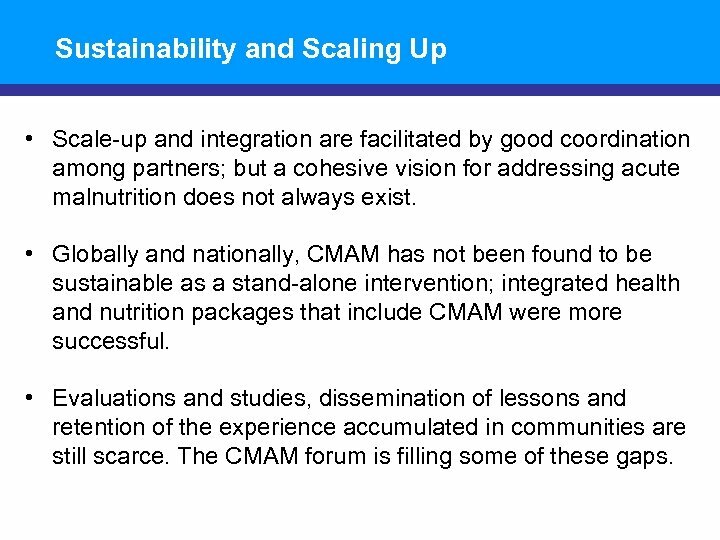 • Globally and nationally, CMAM has not been found to be sustainable as a stand-alone intervention; integrated health and nutrition packages that include CMAM were more successful. • Evaluations and studies, dissemination of lessons and retention of the experience accumulated in communities are still scarce. The CMAM forum is filling some of these gaps. Recommendations: Access, Ownership and Integration, Strategy and Policy, Guidelines 1. 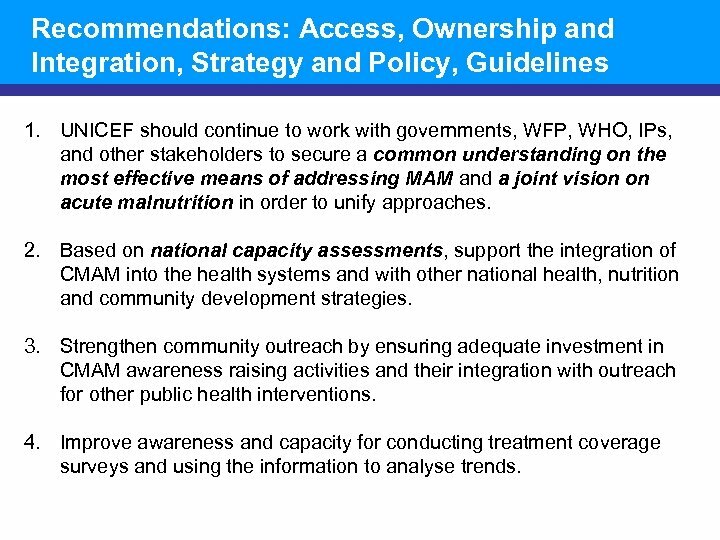 UNICEF should continue to work with governments, WFP, WHO, IPs, and other stakeholders to secure a common understanding on the most effective means of addressing MAM and a joint vision on acute malnutrition in order to unify approaches. 2. 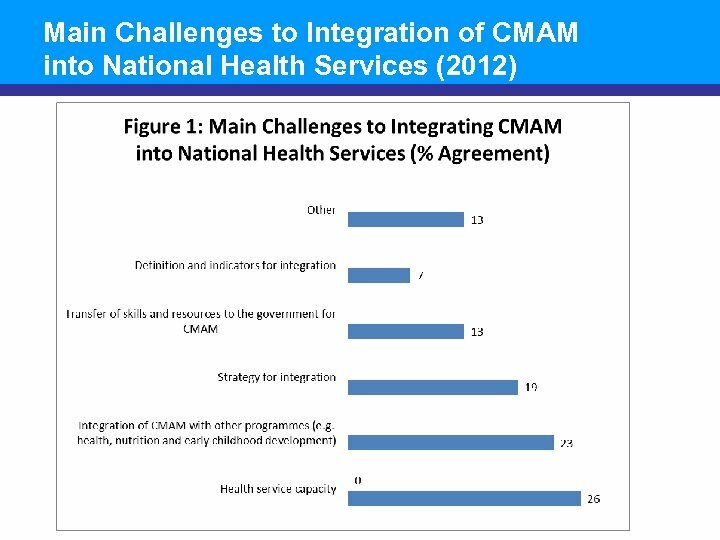 Based on national capacity assessments, support the integration of CMAM into the health systems and with other national health, nutrition and community development strategies. 3. 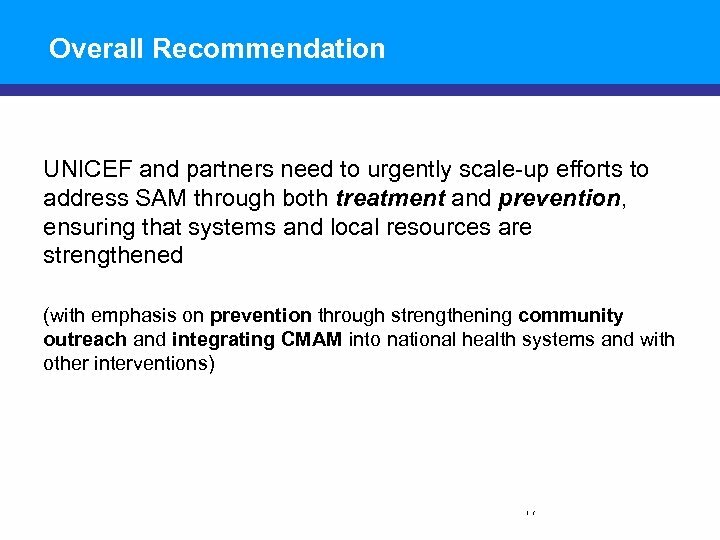 Strengthen community outreach by ensuring adequate investment in CMAM awareness raising activities and their integration with outreach for other public health interventions. 4. Improve awareness and capacity for conducting treatment coverage surveys and using the information to analyse trends. 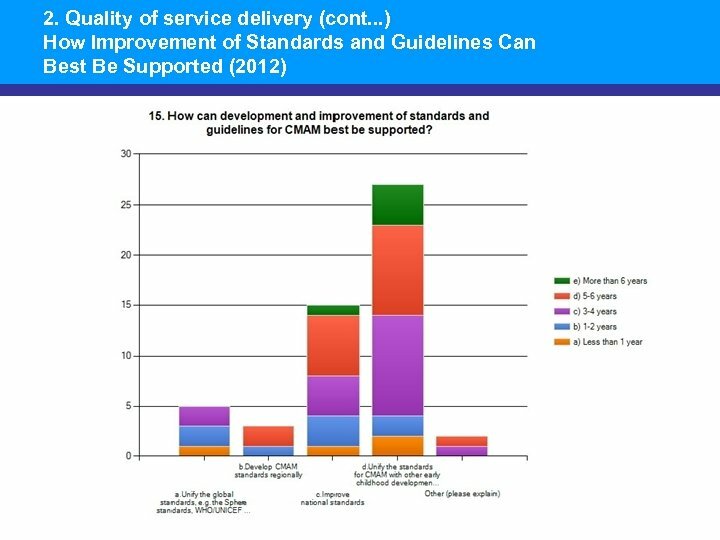 Recommendations: Performance and Quality of Services, efficiency, nutrition information 5. 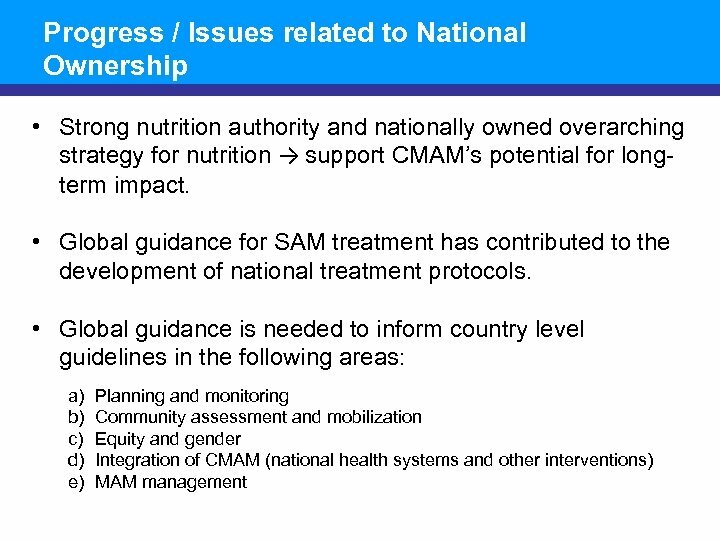 Work with government and partners to strengthen nutrition information systems for improving CMAM quality. • • Support the decentralization of data collection and analysis at district level Reinforce the Mo. Hs’ lead role and joint accountability among the Mo. H and partners 6. 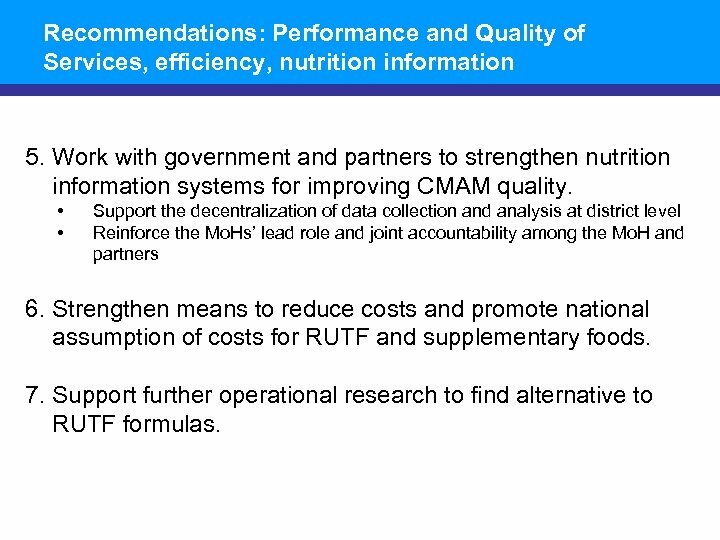 Strengthen means to reduce costs and promote national assumption of costs for RUTF and supplementary foods. 7. Support further operational research to find alternative to RUTF formulas.